Last week I visited the Anne Frank Trust’s Exhibition hosted by Taj Hussein and his team of Level 8 students at Stockwood Park Academy. The exhibition presented Anne’s life story, in the context of the rise of Hitler and fascism, is designed to help others learn about Anne Frank’s life and its message for today’s youth. The students were divided into partners who led myself and other visitors through the exhibition explaining each segment. A brilliantly run showing by the students. I asked the last team of two boys what they were learning from Anne Frank’s story. They both lit up and said: “This story is teaching us why it is so important to stand up to being bullied, and why it is so important to learn to support one another”. They also added that they had realized how relevant this story is to today, and so they wanted others to understand her message. This was what this former teacher was hoping to hear. I first read Anne Frank’s diary when I was their age, and it impacted me deeply. Her heart during the dark days of the rise of anti-Semitism remained throughout her diary one of hope for the future and a belief in people’s ability to care for one another. She had seen first-hand how others put themselves at risk to protect her family and the others who hid with them. She wrote about her dreams and hopes in a way that spoke volumes to me and to the millions that have read her story. Later, as a young teacher of Level 7 and 8 students, I too wanted my students to read this book and think about the message her simple diary teaches us. Her story and the Holocaust should always remind us of why we need to work fearlessly and tirelessly to build a society that safeguards and respects everyone. I grew up and taught as my nation sought to overcome the legacy of slavery and bigotry and to integrate our society. Lessons we are still learning today. That same day, I switched on the TV to listen to the news and heard the unfolding story of how an unknown man had slammed his car into pedestrians on the Westminster Bridge and then run through the entrance of Westminster where he stabbed an unarmed policeman before being shot dead. The man’s name was Khalid Masood, 52, who had been born Adrian Russell in Dartford to a 17-year-old unmarried, white woman and an unnamed father of African descent. Two years later, his mother married. The family moved to Tunbridge Wells where Khalid grew up and was described by his classmates as a middle-class lad who was “happy, healthy, bright, sporty and popular”. His family went to the local church and all seemed normal until he was 18, when “Adrian” seems to have made friends with a rougher crowd and knife crime and drugs became a part of his story. Khalid has left nothing behind that explains the twists and turns to his life or the reasons that would lead him to kill others in the way he did. All that can be done is to listen to the people who knew him and wonder about what might have influenced him. Certainly, his behavior of anger, knife crime, and drugs led to intermittent prison sentences. But he also became an English teacher and married several times and had children. Many have said he seemed to carry a lot of anger and resentment about his life, but others have noted his repeated drug use probably took a toll on his mental health. A sad story with a tragic ending for the 5 killed plus the 50 others injured plus the grieving of their network of families and friends; and the shame and grieving of his own family. His conversion to Islam has also caused those eager to vilify the Muslim community pain through various hate crimes in retaliation for this lone man’s actions. So, I ended my week thinking about these two very different lives and the legacies of both. In one sense both Anne and Khalid were born into situations that would already have marked them out as different and those endangered by others’ prejudices. 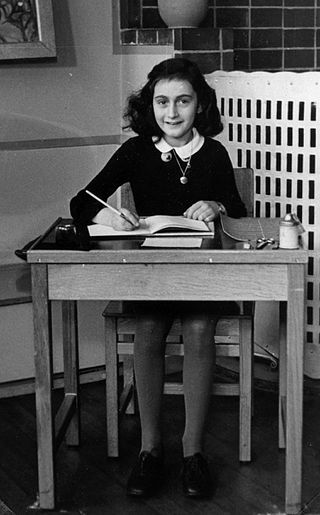 The rise of anti-Semitism, and Hitler were already growing in Germany when Anne was born. Her family moved from Germany to the Netherlands hoping they would be safer from Hitler’s bullies and hateful rhetoric. Anne would grow up with Jewish and non-Jewish friends in school until the Jews were gradually separated from society by Hitler’s laws. Somehow in her family and through those dark years, she kept her dreams alive and her love for others. One can only speculate about the journey Khalid’s mother had with her black son in the 1960’s, but it would seem that her marriage, and their move to Tunbridge Wells provided a stable middle class life for him. There could have been prejudice and shame that corrupted Khalid’s life early on, but one can only speculate. His schoolmates warm remembrances of him just saddens the story because there seemed to be a sense of promise of a young man who would succeed in life but instead will be remembered for the senseless killings of others. Two lives, two legacies…one of peace and hope and the other of alienation and death. Two human beings who like Solzhenitsyn’s quote were faced with choices of how to live their lives. These are difficult times and the pressure of hatred or misunderstanding can lead society to believe that just by pointing at one problem or one group of people that the problems of our age can be changed. But that will only alienate and cause some to seek revenge in violence to others who they see as a threat. And finally, this week has also reminded me of the reality of the world we live in right now demands of all of us the courage to be waging peace daily. The hope of the week for me, was remembering the young men and women I met at Stockwood Park Academy. Each of them as well as others that went through the display were given an opportunity to think about the effects of bullying or maligning others because of race, religion, or gender. I hope most came away from Anne Frank’s story convinced they want to work towards making their communities and school society stronger in learning how to accept one another.